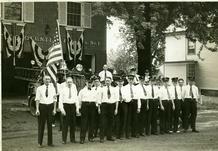 "The First Members - 1923"
One of Chester's long-time favorite summertime activities is the Chester Carnival. 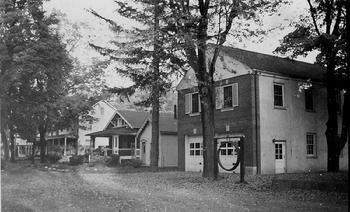 Being the Fire Company's major fundraising event, it started around 1935 and was first held in front of what is now, the Black River Playhouse on Grove Street. They served turkey dinners, played bingo and danced the night away! Later, as the carnival became bigger, it moved to the Borough Municipal building parking lot and then to the Borough Field, both on Main Street. Out growing the Borough field, it is now held at the Chester Township park, Chubb Park. The Chester Volunteer Fire Company put on the area's best parades. 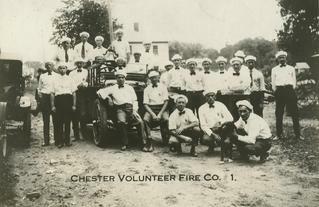 The Chester Volunteer First Aid Squad originated in 1945 as a branch of the Chester Fire Company #1. Its first rig was a Ford station wagon from the Civil Defense that was converted to serve as an emergency ambulance. In its first year, the squad handled 23 emergency calls. In 1954, The Fire Company and First Aid Squad held its first Fund Drive and 1959 the Squad broke the century mark with 104 responses. In 1987, as the call volume continued to increase, the Chester Volunteer First Aid Squad became independent of the First Company and membership was opened to any resident of the Borough or Township of Chester.